Sometimes classified as Americana or alternative country, Red Dirt is as much an attitude as it is a genre. Independent recording labels are the deals of choice rather than a deal with Nashville. Dreams of playing big arenas are secondary to playing Billy Bob’s Texas or the legendary Gruene Hall, Texas’ oldest dance hall, and fans are earned by long hours on the road playing the more intimate venues across the state and the country. Texoma has a chance to catch a sample of Red Dirt this fall. Singer/songwriter Slaid Cleaves—who appeared this year at Sherman’s Hot Summer Nights Thursday music series —told stories about people, places and feelings that are familiar to everyone. Cleaves leans toward the folk side of Red Dirt with his honest, gritty voice stirring up emotions of loneliness, regret and faded love. Cleaves makes a return appearance in Texoma on November 1 as part of the Denison Arts Council’s Texas Singer Songwriter Series. For Red Dirt tinted with lots of blues, Carolyn Wonderland (who appeared in August for the Texas Singer Songwriter Series) has frequented the Roots Music Report’s roots rock chart. Wonderland’s rocking blues and guitar skills have made fans out of some big names in music, including Bob Dylan and Asleep at the Wheel’s Ray Benson. 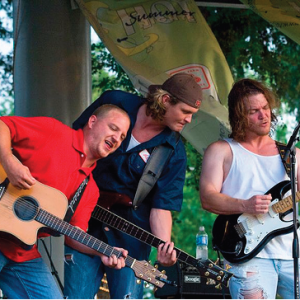 Spur 503 has developed a large following over the years as Texoma’s proud local band. Since its release in spring, the single “It’s All my Fault” off Spur 503’s new CD “Raisin’ the Bar” is getting airplay on Texas music radio and has been in the top 20 requested songs on RadioFreeTexas.org.